My journey takes me to the great state of Maine, Bar Harbor to be exact, to find tonight’s brew. Beer #339 is Manly Men Beer Club presents El Hefe by Atlantic Brewing Company (actually brewed by Salisbury Cove Associates, Inc…a part of Atlantic???) which happens to be a Wheatwine, another new style for me. Similar in style to a Barleywine, a Wheatwine has a heavier presence of wheat malt. The ABV is pretty heavy too coming in at 9%. My wife is going to love me tonight after I finish the bomber, or 22 ounces of this beer. 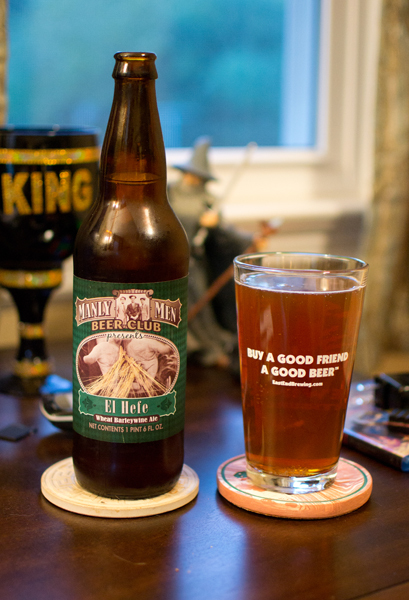 El Hefe poured a clear amber…it kind of looked like honey. Where was the head for it was nowhere to be found. It smelled like a very subdued Barleywine…nothing but a malty kind of sweet smell here. Caramel, raisins, crust from freshly baked bread…those were the primary aromas. The slightly sweet caramel of the malts started off the taste. The nice flavor of bread then takes over for the rest of the drink. I got a bitter chocolate flavor in the aftertaste…not sure where that came from. The alcohol was noticeable…more so as this warmed up as it did because for me it was a sipper. It was a bit syrupy and sticky but not really heavy in the body. The carbonation was quite low. It was a really smooth drinking beer.